Kuramae (蔵前) is located between Asakusabashi and Asakusa. On Edo Street from the Kuramae Station to Asakusabashi station, there are many interesting stores. It is one of the very interesting shopping district in Tokyo. 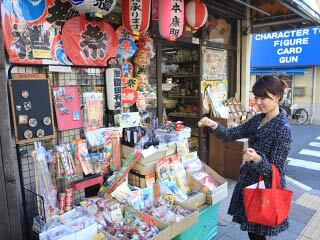 There are wholesale stores of Japanese traditional toys around the Kuramae station. Because it is wholesale district, most of the stores close on weekend. 1. use Toei Asakusa Line to Kuramae. Kuramae literary means front of Rice Storage. There was rice storages for Tokguawa Government during Edo period. Today, it is known as the wholesale district for Japanese traditional toys.